Multi Commander is a free, extremely powerful alternative to the default Windows Explorer file management system. 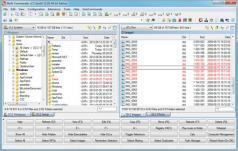 This free, multi-tabbed file manager takes advantage of the dual-panel layout and is equipped with all the features of the standard Windows Explorer. On top of essential function, Multi Commander gives you tons of extra features perfect for carrying out advanced tasks – automated unpacking and sorting, the ability to browse inside archives, support for scripting, built-in search and many more.